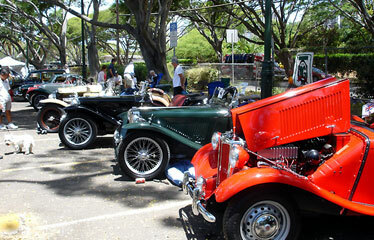 The British Car Club of Hawaii presents its 15th annual All British Car Day Sunday, with more than 70 of the most elegant cars from the 1940s through today on display from 9 a.m. to 3 p.m. at Kapiolani Park, adjacent to the Waikiki Shell's mauka parking lot. Admission is free. Those who share enthusiasm for the cars are welcome to meet and mingle with the car owners and swap stories about classic British cars. The BCCA will also be presenting a check to the Easter Seals Hawaii Chapter to help in their charitable work. More than 70 of the most elegant cars, including MGT's above, will be showcased during All British Car Day Sunday. Organizers of MAMo: Maoli Arts Month 2007, will present a Wearable Art Show from 5 to 9 p.m. tomorrow at the Hawai'i State Art Museum, 205 S. Hotel St. The part-fashion, part-art show will feature pieces ranging from headdresses to high-end apparel from 21 Hawaiian artists. The event will also showcase Hawaiian artwork and body adornments used for ceremonial rituals, cultural practices and everyday wear. This would include traditional forms like leis (shells, nuts, flowers, ferns), kapa, lau hala, hulu (feather work), mea kaua (weaponry) and kakau (tattoo) in a show that will incorporate Hawaiian performing arts into an evening of art and entertainment. Tickets are $250, with proceeds benefiting future festivals. The semiacronym, MAMo, stands for Maoli Arts Month. "Maoli" is a Hawaiian word to describe things native or indigenous which applies to the core of the monthlong celebration of native Hawaiian artists. Call 754-2301 or visit www.maoliartsmonth.org. 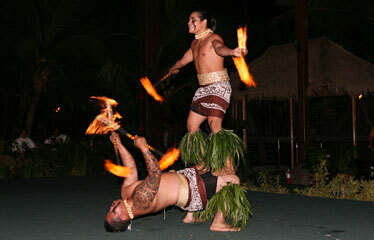 The Polynesian Cultural Center's 15th annual World Fireknife Championships wrap up tomorrow night in the Hale Aloha Theater, with the preliminaries of the men's competition starting at 7:45 p.m. today. More than 30 competitors are expected to join in the festivities to see if they can make it to the finals and show in the PCC's Pacific Theater. Tickets for tonight's preliminaries are $8 for adults and $6 for ages 3 to 11. Seats are almost sold out for the finals, which start at 8 p.m. tomorrow. Tickets for the finals are $40 for adults and $30 for ages 3 to 11. Call 293-3333 for reservations. Along with flames and heart-pounding dancing, guests will also have the opportunity to attend the Samoan Cultural High School Arts Festival from 9 a.m. tomorrow in the Pacific Theater. Students from Hawaii high schools will demonstrate their Samoan cultural knowledge and skills in friendly competitions in activities such as basket weaving, coconut husking, banana peeling, fire making, singing, dancing and oration. PCC is at 55-370 Kamehameha Highway in Laie. Maui duo Austin De Rego balances on Conan Higa during the Duets competition of the 15th annual World Fireknife Championships. WASHINGTON » The presidential candidates have traveled a great distance, in miles, years and station in life. Sights, sounds, keepsakes and a tangy olive burger remind them where they came from. The Associated Press asked several presidential candidates to name the item that most reminds them of where they came from. 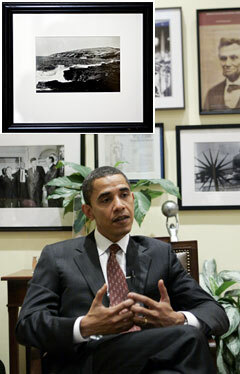 Democrat Barack Obama, who had an unsettled childhood, said a photo reminds him of where he came from. Born in Honolulu, Obama's mother divorced when he was 2 and he lived in Indonesia for four years until his mother and stepfather sent him back to Hawaii, at 10, to be schooled there under the care of his grandparents. The picture, on the wall of his Senate office, shows Oahu's cliffs and crashing surf, where his mother's ashes were scattered after her death in 1995. Presidential hopeful Barack Obama keeps a picture of the Oahu site where his mom's ashes were scattered on his Senate office wall to remind him where he came from. Everyone can join in the fun at the Gardening for Seniors open house, 9 a.m. to 2 p.m. tomorrow at the Urban Garden Center, 955 Kamehameha Highway. The event is free with educational displays, ohana plant sale, senior idea garden, bonsai display, cooking demonstration, door prizes and more. Head to Pacific Home on Wednesday and get cozy with Wade Oppliger, who will give an informal talk, "Let's Get Comfortable." Enjoy complimentary wine, soft drinks and light pupu 5:30 to 7 p.m. Wednesday as the regional account manager for Mitchell Gold & Bob Williams home furnishings shares home and lifestyle tips. The free event will be held at the Pacific Home showroom, 420 Ward Ave. Call 596-5338. If you can teach haku lei making, want to teach keiki how to make binoculars, can make crafts with a natural or recycled native product, Hui o Laka needs you. The group, which represents the Koke'e Natural History Museum and Hawaii Tourism Authority, is preparing for its 18th Banana Poka RoundUp, an all-day environment education fair being held May 27 on Kauai, and is seeking instructors, crafters and volunteers. All participants will receive a free festival T-shirt and plate lunch. Call (808) 335-9975, ext. 0, 22 or 23, or e-mail kokeemuseum@earthlink.net. The festival is named for the spreading banana poka vines that sport candy-pink blossoms and threaten to crowd out native Hawaiian plants and trees of the upland forest.